The chair of the Ethnic, Race, & Migration studies at Yale University affirmed Monday that she and 12 other senior faculty are withdrawing from the academic program because it isn’t getting the needed resources that students deserve and that university leaders have been promising for years. The issue is problematic on two levels, said Dr. Alicia Schmidt Camacho, an American Studies professor and chair of the ER&M program, who spoke on behalf of the group, all of whom will retain their other faculty positions. At one level, “a growing set of responsibilities to students” in the midst of insufficient resourcing makes it difficult to “ensure the integrity of the program is intact,” she said. Additionally, she added, questions around staffing, curriculum and advising “are just fraying at the integrity of the program” and don’t best serve the 87 student majors. On another level, Camacho said, program faculty “have been raising questions about the institutional climate for our fields of study where we’re not gaining any ground and we’re not gaining permanency within the university” for various fields of ethnic studies. While the ethnically diverse program faculty are assuming the burden of carrying the growing ER&M program without pay or recognition – or participation in the promotion and tenure processes – programs in the school of arts and sciences are losing Black faculty, flat in Native American staffing and are not consistently building capacity across ethnic studies programs, she said. Although they have committed to remaining with the program until the current junior and senior classes finish, the withdrawal of Camacho and her 12 fed-up colleagues could decimate the bachelor’s degree program. They represent more than two-thirds of ER&M’s 19 faculty and every tenured one, as well as everyone who has chaired the program since its inception in 1997. Additionally, all are program officers and hold faculty positions elsewhere on campus – four are endowed chairs, two head residential colleges and four are program or department chairs. They announced their intent to withdraw their labor from the program on Friday, individually sending letters to Dr. Tamar Szabo Gendler, dean of the faculty of arts and sciences. They also issued a news release describing their decisions, which they attributed to “the pattern of unfulfilled promises by the university” and “administrative disinterest” in the program. Neglect of the growing program’s needs seems odd when it is driven by “an alliance of academic excellence whose scholars win teaching and writing awards and are visible in public discussions of race, labor, migration and indigeneity,” noted Dr. Michael Denning, the program’s faculty co-founder and the William R Kenan Jr. Professor of American Studies and English. Faculty have been raising the issues since 2002, Camacho said, and there has been no progress despite repeated assurances from the administration and its announcement in 2015 that it would devote $50 million over five years to improving faculty diversity campuswide. 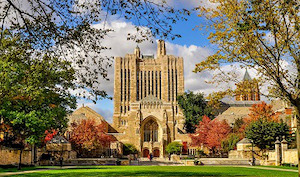 Yale president Dr. Peter Salovey responded to the group’s announcement with a brief statement. Two new senior faculty were hired into the program last year, he continued, and two more are expected to be hired this year. “It is my great hope we can discuss the future of ER&M in a spirit of collegiality: the program and its wonderful students deserve no less,” Salovey concluded. The administration declined to answer questions from Diverse about how many of the 65 new faculty hired campuswide in the last three years have been tenured, why the ER&M program has no Black or African-American faculty, and how the administration plans to address the faculty concerns.